BNSF GE ES44DC 7426 leads a pair of Dash 9's and finally another ES44DC around the world famous Tehachapi Loop. early in the morning of the 5th October 2016. Once our voyage across the USA by train was over last year it was by no means the end of our trip. With a hire car in hand we had a week to visit several locations in California- we could have easily spent much longer at each of them but I'm sure we will re-visit before too many years have passed. The most famous of Californian railfanning locations is undoubtedly the Tehachapi Pass, the busy freight corridor running between the San Jaoaquin Valley and the Mojave desert. 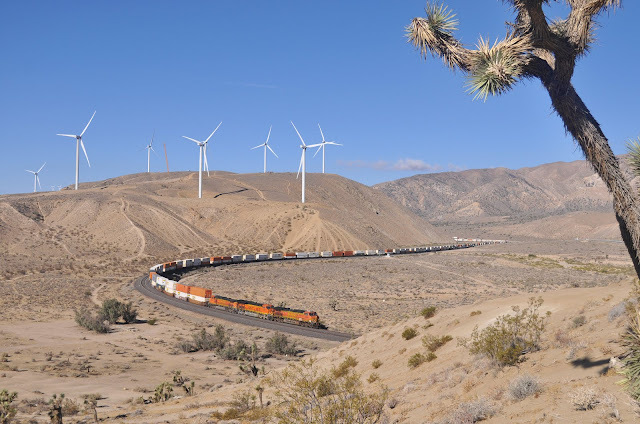 The railway from Bakersfield to Mojave was constructed by the Southern Pacific in the 1870's and today is operated jointly by the Union Pacific (successors to the SP) and BNSF railraods. 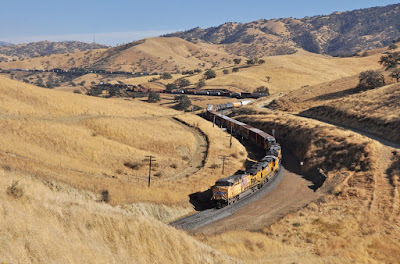 Myself and James had a great head-start for our day of railfanning as seasoned Tehachapi photographer Darryl Bond (you can find his site in my links) had very kindly put together a guide to 'A day at Tehachpi' for me- I hope he might publish it himself as it was a super useful resource. We were starting out early from Lancaster and following our guide our first stop was just north of the town of Mojave hoping to catch a train during the 'morning rush'. 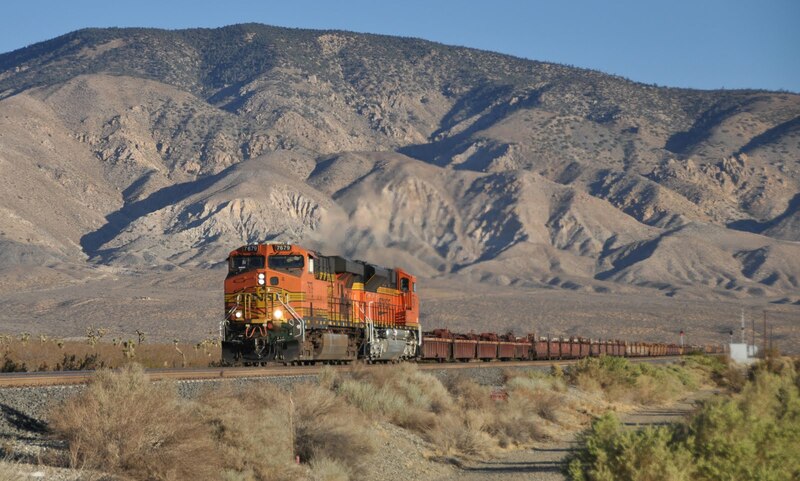 We didn't have to wait too long for BNSF 7679 (GE ES44DC) and 8517 (SD70ACe) to appear with an empty southbound Intermodal. We were dead pleased with the photo with the mountains behind even if we would have preferred a loaded train. Our next location was the Warren curve, which involved an interesting 'off road' drive up onto the hills. We'd probably have never found the location were it not for the map that Darryl has produced detailing exactly which tracks we should follow and what landmarks we should encounter on the way. We got the poor car almost the whole way to the spot we wanted when we decided we'd be better continuing on foot. Once out of the car we quickly changed our minds- the wind was unbelievable! No wonder the hills opposite us were adorned with a great number of wind turbines. James inched the car forward and we eventually had some shelter within which to wait for the trains amongst the Josuah trees. It was over half an hour before a train appeared, Another empty intermodal, this time with UP traction but at least it was in the right direction once again. 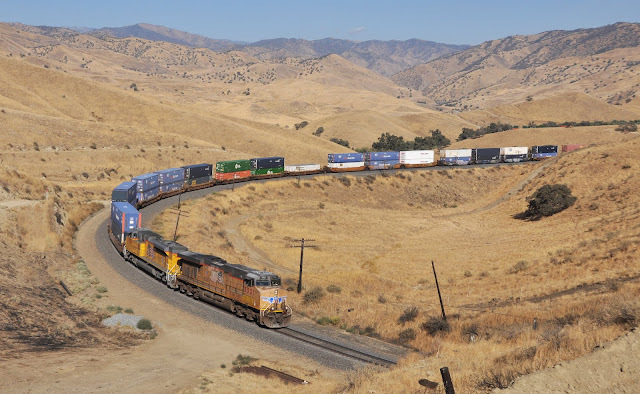 Right behind this was what we really wanted, a loaded BNSF train with a three GE Dash 9-44CW's up front and another two on the rear. 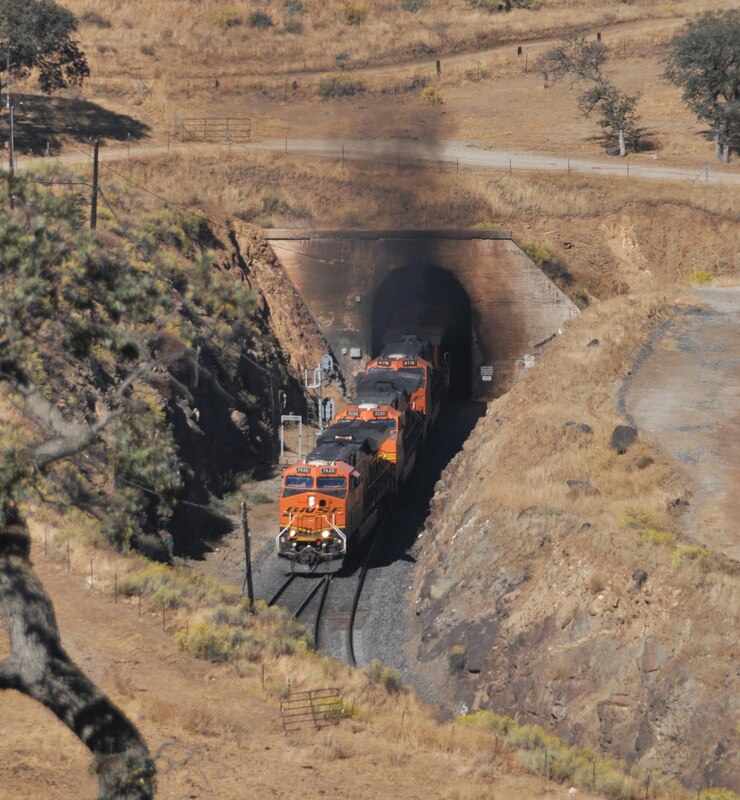 A trio of BNSF Dash 9's lead a loaded train around the Warren curve. Only the wind turbines give any suggestion of how windy this place really was! BNSF 7426 leads a train out of the tunnel #9 on the loop. Having got what we wanted here it was time to head back down, re-tracing our tracks and following the map (and GPS on our trusty, but somewhat temperamental Sat-Nav 'Emily'). 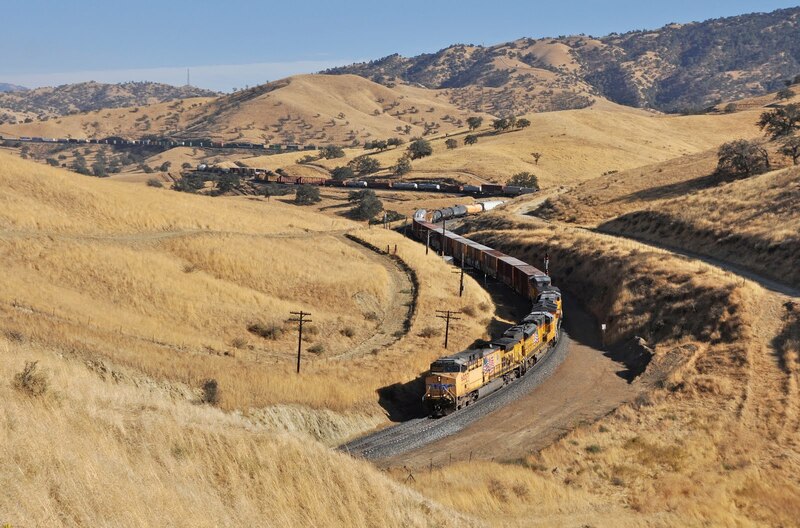 Next stop was the 'must see' Tehachapi Loop itself. Unfortunately the freedom to roam over the land here is long gone, as are the Santa Fe Warbonnets which I so strongly associate with the location. Today there is a viewing area high above the loop where railfans can watch the trains. The views are somewhat limited but a view of the entire loop is possible. We had to wait a little longer for some trians here, but were rewarded once again by two southbound intermodal trains, one from both UP and BNSF. After this the trains dried up. We had been warned that traffic could be sporadic, and particularly during late afternoon there could be significant gaps. What we really wanted was a northbound train, of which we had seen precisely zero so far- after an hour we gave up and headed for lunch. from the same viewpoint as used for the loop itself. Even lunch was specified on Darryl's comprehensive guide. It took us a while to find The Steampunk Cafe in old town Tehachapi, but the recommended 'Kent's 51/50' burger did make it worth the effort. Lunch wasn't a particularly quick affair but with the lack of trains we weren't too worried- we probably missed loads. After finishing the meal it was time to head further north along the pass to some more locations in the Bealeville/Caliente area. I got a bit confused here with the various tunnels- after a bit of exploring and a few discounted locations we found ourselves following the delightfully named 'Caliente Bodfish Road', which is an equally delightful drive. in the loop. 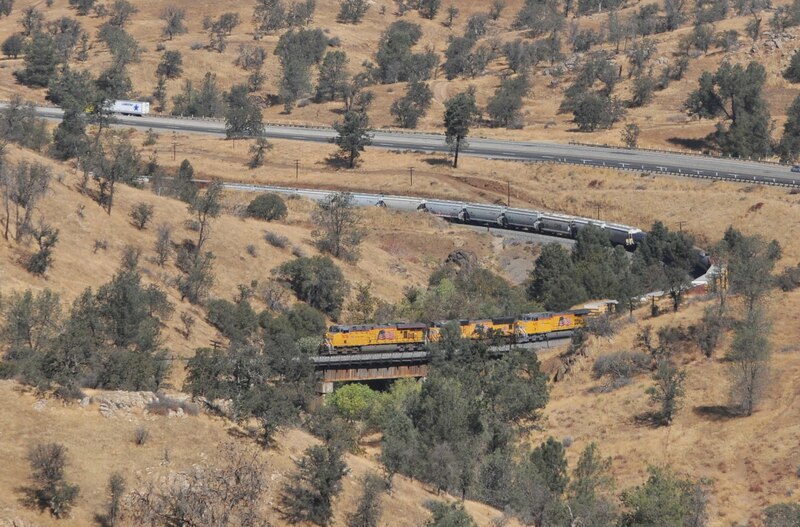 The railway in the Caliente area twists around the mountains. We found a couple of spots for photos but eventually settled on the position above Tunnel #2, where we could even see a northbound train approaching in the distance. It was 45 minutes until a train actually passed us however, and that was a southbound UP Intermodal, which made a much better photo rounding the curve into the tunnel. Shortly after this passed the northbound train finally started rolling and that too was photographed approaching Tunnel #2 from the other side. As soon as this had cleared (we didn't even wait for the helper loco on the rear) it was back in the car to chase the train to another spot on the Caliente Bodfish road which we had seen earlier. 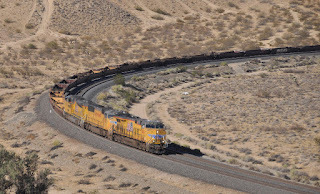 We needn't have rushed as we beat the train by quite a substantial margin, it having to snake around the large horseshoe curve at Caliente itself. Unfortunately the photo could have been better- another southbound train was snaking through the second line next to it. What this did mean of course was that another train was already rolling. This presented a dilemma, as while it was only mid afternoon we had to get back to downtown LA due to an error on my part in booking some tickets for a show that night (it was supposed to be the day we were on the Cajun pass, much closer than Tehachapi!). We had a three hour drive ahead of us and if we were to have any chance of getting dinner it was time to leave now. But there was a UP mixed consist sitting in the sidings at Caliente just waiting to go... could we really abandon it? Of course not. UP ES44AC 5521 leads 9031 (which I can't identify!) towards tunnel #2 with a southbound intermodal. 5/10/2016. 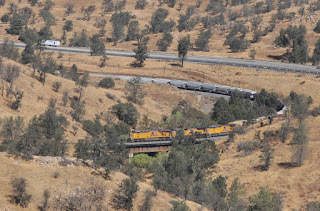 For this train we climbed the bank where the Bealeville road passes under the railway just before the Caliente grade crossing. It wasn't a bad shot at all given its hurried nature and we were rewarded with UP SD40M-2 2667 leading three classmates over the bridge and up the grade. Finally the Tehachapi loop seemed to be getting busy and the longing to chase this train back to the loop was huge- but we had already used most of the contingency time in our drive and dinner or no dinner it was time to start the long drive south. We came away with some good shots, but more time is definitely required to do this pass justice. Tehachapi is somewhere that photographers will come back to again and again and still find different angles and having got our bearings I'm sure a longer stay will be on the cards next time. Whenever next time may prove to be! Thanks again to Darryl for the useful guide- we probably wouldn't have got half the shots without it. 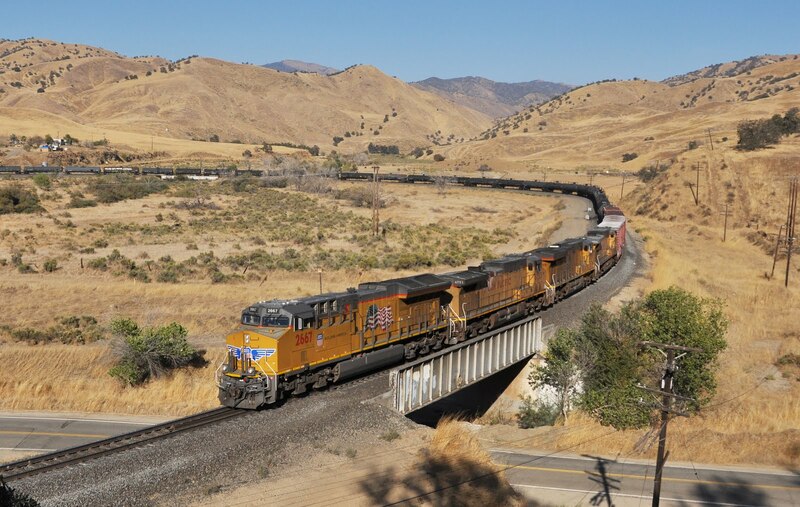 The final shot on the Tehachapi pass, on the Bealeville Road with Union Pacific GE ET44 2667 leading a mixed southbound trains. 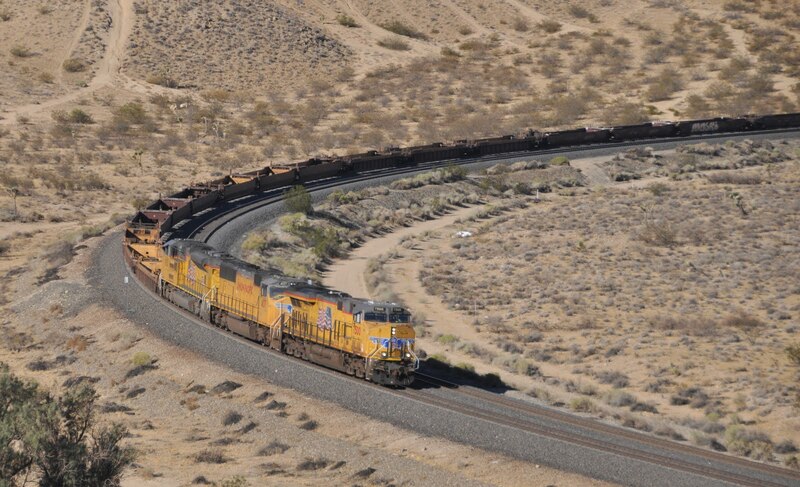 It had just left the sidings at Caliente and is climbing as it heads south.